I haven’t done too much this week, as I wasn’t feeling too good. But I’d like to get back to posting news habit after my very busy summer, so here’s my update. 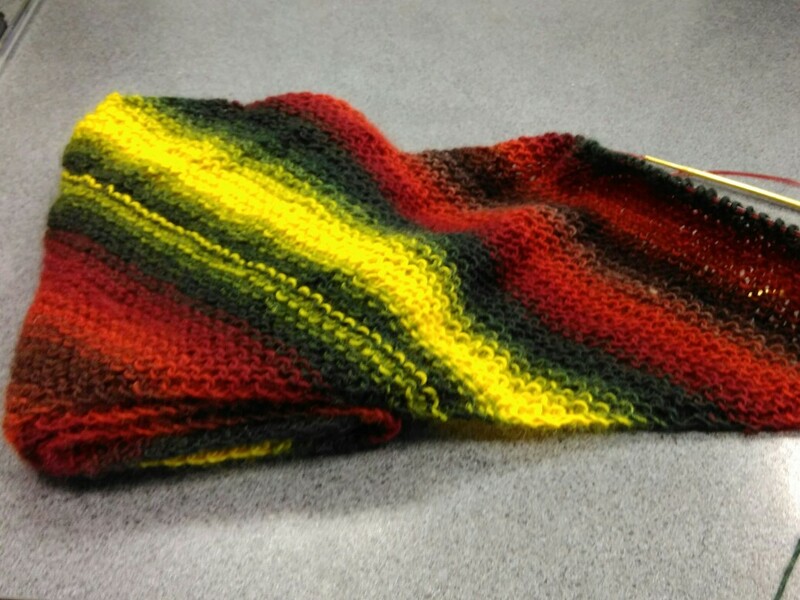 I have worked a bit on the scarf – I’ve used about 1/3 to 1/2 of the 2nd skein so far. After I finish it up , I’ll decide if I plan for 3 or 4 skeins in total (out of 9 I have bought – but I plan to make a hat as well, and my son has requested mitts… We’ll see). I also worked quite a few rounds on my mom’s hat, only to realise, I increase too quickly after I took pictures last time. So I had to rip back, and haven’t touched it since. I find it happens to me often when I work on things in round in crochet without a pattern – it takes about 5-10 rounds in my experience to really show that you’ve increased or decreased too much or too little at a certain point? Or is it just me not trusting my gut feeling enough? I usually suspect it’s not right, but am never sure until I work a few rounds more. Really great scarf colour and mitts would look good too! The scarf looks gorgeous, love the colours. Wow you’ve been really busy! I love the colours in your photos. Good luck with your list!!! i know the feeling! Thank you. Having a plan always helps. So many wonderful things you’ve been working on and some finished. I think my favorite might just be Garry the Snail. So colorful. And cute! Wow, you’re doing really well with your list! That’s dedication! I’m always carrying on too long with things when I have a gut feeling they are too big or too small or too something else. I think we all do it! I find the hardest decision is to stop and rip back. Once I’ve done that I’m motivated to move forward again! I agree. I also think I might just hope that it will turn out OK eventually and carry on longer than necessary. After posting about it last night, I got really motivated, and it’s almost done now, and shaping looks OK this time. Thank you! I am sure the list will evolve, I’m still brainfrozen after a hectic and knitting-less summer. I am with you, if I have to unpick a project gets relegated to a heap before I am happy to start on it again. Your To Do list will get longer but you have done well so far. I am sure it will, especially after such a headstart! Great colors! Love the scarf. And, good for you having a list! I wish I could be that organized. Thank you! It’s a Ravelry group “A Year of Projects” that keeps me organised. Love the way the scarf pattern is working up. I have a list too – it grows bigger not smaller ! I have so many WIPs its ridiculous!